Mayor Anibal Meléndez Rivera of Fajardo, center, poses with CHS students, Foreign Language Chairperson Eli A. Torres and other chaperones at the City Hall. 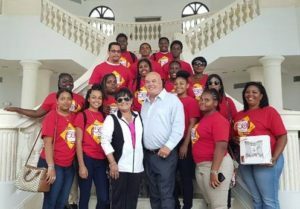 Twelve foreign language students from St. Croix Central High School (CHS) got the chance to travel to Puerto Rico and experience Hispanic culture of the neighbors to their northwest. The students who are learning either the Spanish or French language at the high school were in Puerto Rico from April 16 -20 with their maestros (teachers) on a cultural and educational trip. They visited several places of interest: the Capitol in San Juan, El Morro, a citadel in Old San Juan, El Yunque National Forest, La Bio Bay, El Faro in Fajardo, the City of Ponce, the Serralles Castle, and other places. The maestros accompanying them were CHS Foreign Language Chairperson Eli A. Torres, Dr. Annette García, Monifa Steele and Esthan Said. The workshops were offered in Loiza, a traditional town with strong Africa influences. The students visited and received guidance from interactions at the Inter-American University of Fajardo and the IBC Technical College. “This experience was enriching for the students because they learned about the culture of a Spanish-speaking country and its political system. They also engaged in a cultural exchange with students of the School of Fine Arts of the Municipality of Fajardo,” Torres said. This CHS foreign language trip to Puerto Rico was sponsored by the Community Foundation of the Virgin Islands, the Virgin Islands Lottery and the Department of Sport, Parks and Recreation. Among the many supporters in Puerto Rico was Mayor Anibal Melendez of Fajardo. Torres arranged for the management of the Burger King Company to offer free coupons to students for burgers, drinks and other meals.